However, in simulations of galaxies we can explicitly see the SFH in high resolution (see these ‘bites for previous examples). The authors of today’s paper looked at galaxies in the state-of-the-art Illustris simulation. They found that, whilst SFHs tend to be noisy, on average they show similar shapes over time. This shape is known as the log-normal distribution, and it typically exhibits a sharp rise to a peak, then a gradual fall. Figure 1: Top panels show the SFHs of two different galaxies in Illustris, measured in solar masses per year. 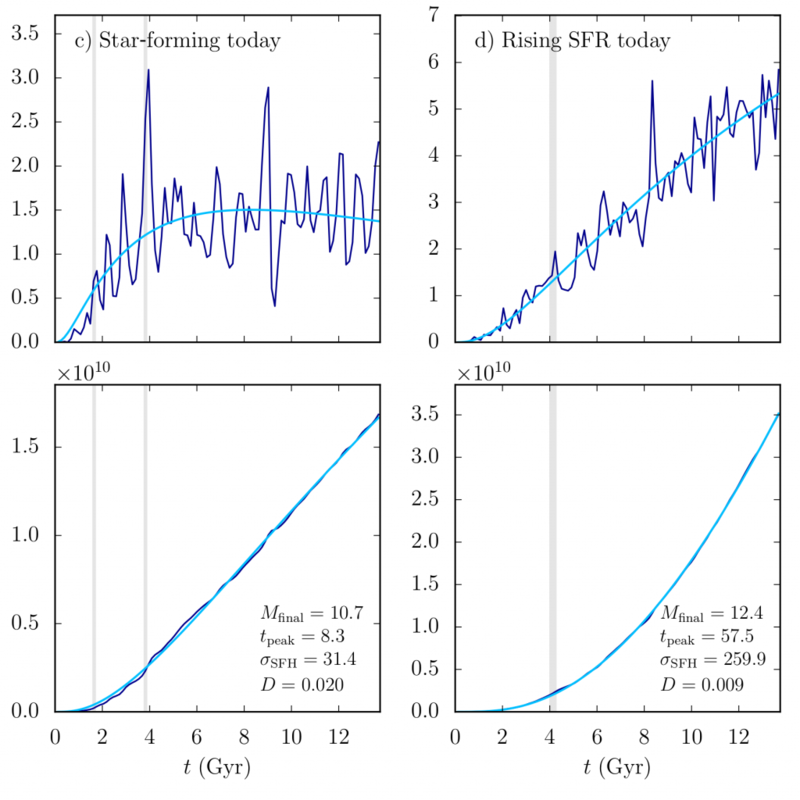 The bottom panels show the cumulative SFR in solar masses. Galaxy (a) is a massive central galaxy, with a thousand billion suns worth of stars, whereas galaxy (b) is a smaller satellite galaxy whose gas gets stripped by its host, and ends up with only a billion solar masses of stars. Figure 2 shows another two galaxies that are also very different. Both are still forming stars today, and galaxy (d) actually has an increasing SFR. Despite having very different forms for there SFH, the log-normal still provides a good fit. Figure 2: As for figure 1, but for two late forming galaxies. Galaxy (c) is a galaxy that is still forming stars today, and (d) is a galaxy whose SFR is actually rising. The authors find a correlation between the time of the peak, and the width of the distribution: earlier peaks tend to be narrower, whilst later peaks tend to be much wider. In other words, galaxies that form early assemble quickly, whereas galaxies that form later take their time, leisurely building up mass over a longer period. 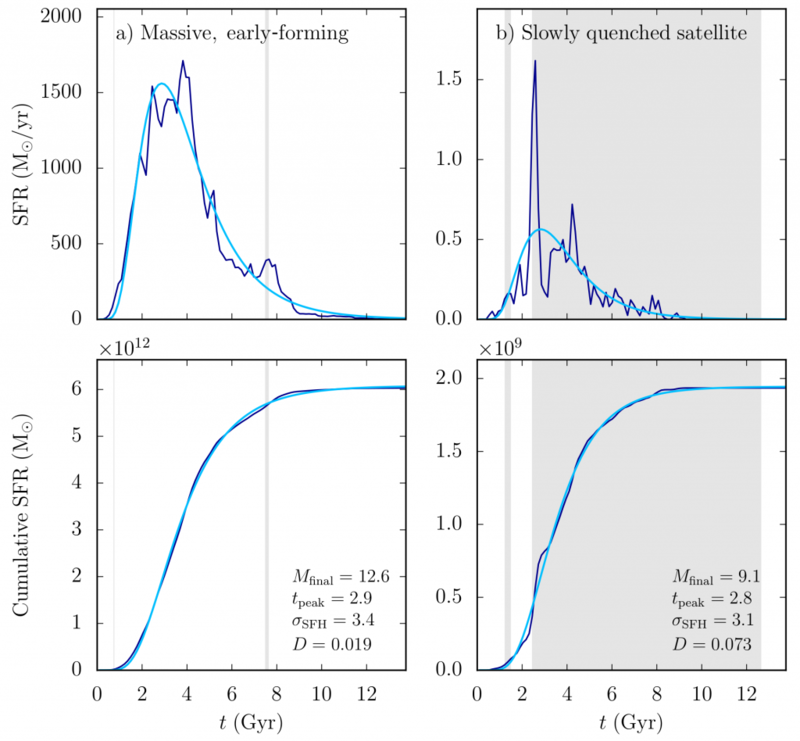 You can see this in the examples in figures 1 and 2; the galaxies that form most of their stars early have narrow distributions, whereas those that are still forming stars have much wider distributions. Log-normals are not without their limitations. Interactions between galaxies, such as mergers, can lead to bursts then sudden shut downs of star formation that log-normals struggle to fit. But for most massive galaxies, log-normals describe their story arc in terms of star formation very, very well, helping physicists to understand every galaxies story, from start to finish.